A top prizewinner of many international competitions, pianist Michael Bulychev-Okser is among the world’s foremost artists and teachers. At age 12 Michael began his first concert tour to the countries of Mediterranean: Greece, Israel, Egypt and Turkey. An honored alumni of The Julliard School, Michael collaborated with world’s most notable musicians: Oxana Yablonskaya, Dmitry Yablonsky, Martin Canin, David Dubal, Richard Kimball, Jonathan Strasser, Gidon Kremer, and Mikhail Voskresensky. An extensive performance schedule finds him dividing his time between Europe and the United States in both solo performances and appearances with the world’s top orchestras: including Manhattan Philharmonic, Novgorod Philharmonic, and Parnassos Symphony. 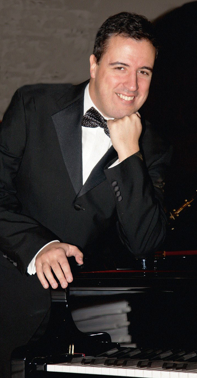 A recipient of “Who’s Who in Music”, “Outstanding People of the 20th century” among other Awards (Cambridge, London , 2001 and 2001 years), Michael Bulychev-Okser performed at the world’s most prestigious stages: Carnegie Hall, Merkin Hall,Steinway Hall, (New York), Kennedy Center (Washington D.C.), La Salle Pleyel (Paris, France), Wigmore Hall (London, United Kingdom), Heichal Hatarbut (Tel Aviv, Israel), Palace (Alexandria, Greece), IBK Concert Hall (Seoul, South Korea), and Rachmaninov Hall (Moscow, Russia) and Centermex Theater (Monterrey, Mexico). Bulychev-Okser’s discography includes recording of Beethoven’s Pathetique Sonata, and Granados’s Goyeskas (RCA label). Bulychev-Okser’s New CD featuring Piano Transcriptions of Past and Future was released in December of 2012 on Neue Sterne Classical Artists Label, Hannover, Germany. Michael Bulychev-Okser is a Professor at New York University since 2003 and Long Island Conservatory since 2002. Michael Bulychev-Okser is a Founder and Artistic Director of G.Gershwin International Music Competition in New York, and Founder and Artistic Director of Alion Baltic International Music Festival, 2014 in Tallinn, Estonia.